I notice Markers 5 and 8 every time I'm up there. And recently Betsy Northam mentioned the locations of others, piquing my interest. Betsy is the wife of Jack Northam (Wtny n1 on this board), who regularly does Whitney doubles. With Betsy's guidance, on a recent trip I found Markers 3, 4 and 7. I probably would have found 10, too, but neglected to bring along her description. Next time. Anyway, this work in progress can be seen at Mt. 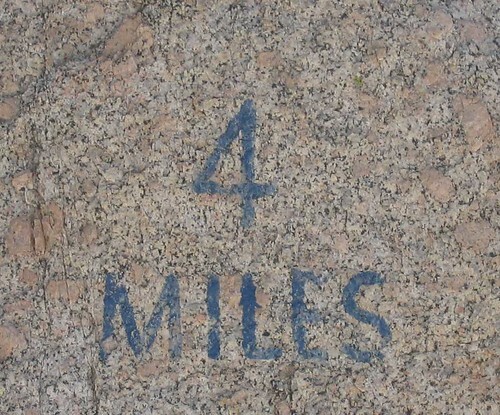 Whitney Mileage Markers. I welcome help in filling in the blanks. In particular, SummitSeekr may be interested. From his post last year: "A few years ago I contacted the local forest service and told them I'd bother to take up a little can of paint and a brush to refresh the fading markers. Well, they had an absolute hissy fit saying that the markers detract from the pristine nature of the trail." Whether or not it is possible to enhance these relics, it would be nice to have a complete documentation of where they are. I think most Mt. 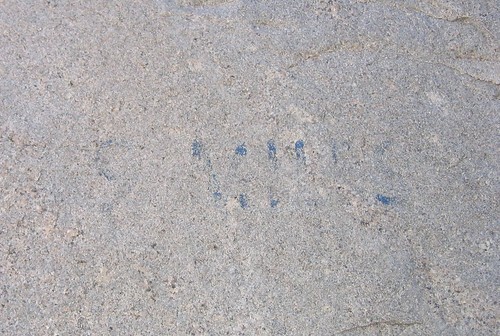 Whitney hikers would welcome being able to log their progress up the mountain. Furthermore, the markers provide a nostalgic link to those who preceded us, more than a half century ago. Bob, if you or someone else could give me the GPS readings for markers 7 & 8, I would add them to my 97 Switchbacks map. As a matter of fact, I wouldn't mind having readings for all the others, as I would add them to my topo map of the main trail. Wayne, do you know how much a GPS receiver weighs???!!! Bob, you're right--the old ones way a ton! If you could tell me how many steps from a switchback, or if the marker is right at a switchback, that would do. I hate to see a grown man weighed down by a GPS receiver, especially when I know you like to keep your head high and savor the vistas! I think you could pick a coordinate for the 8 mile marker off your topo software and be within 20 feet if you cross reference it with the 13300' elevation. 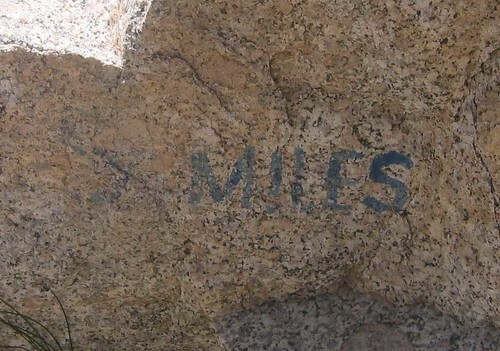 Thanks, Scott M. 13,300 puts the 8-mile marker right at switchback #93. Bob can confirm this the next time he gets a chance. 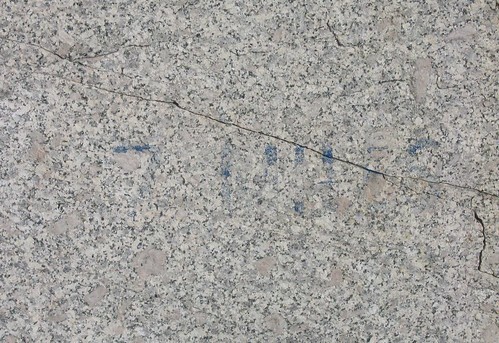 The 7-mile marker should be below the cables. If anyone would like to see the map of the 97 switchbacks, you can see an Excel version here. The map at 300 feet per inch was designed for legal-size paper (8 1/2 x 14), but works okay on a standard 8 1/2 x 11 sheet of paper. 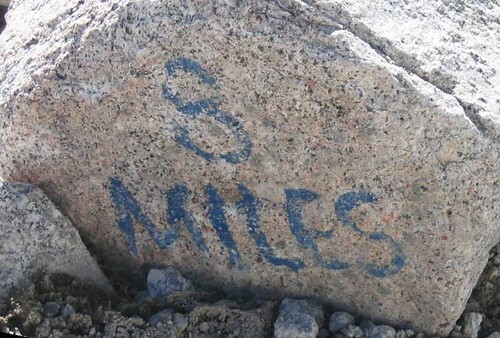 Are you sure that the 8-mile marker is that low? Your GPS data indicates 1,271 feet from switchback 97 to Trail Crest and that is almost a quarter mile from the "8.2 mile" point via the old trail. Your data would imply that it is somewhere near switchback 97. The latest information I've been given places the 8-mile marker about half way between switchbacks 94 and 95. When I get confirmation, I'll produce an updated map. Just did Whitney yesterday. The 8 mile marker was abaout 2/3 the way up the swithbacks. I did not bother to count!! With Betsy's fine directions, I located #10 yesterday and put it into Mt. 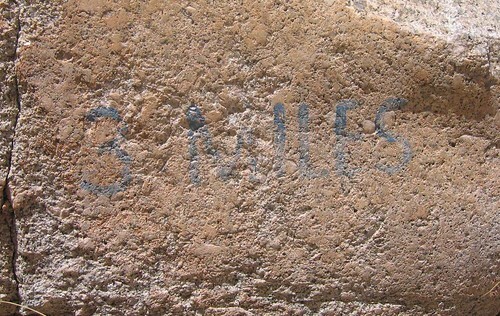 Whitney Mileage Markers. Interesting that a topo shows the distance from #9 is about 1.4 miles. 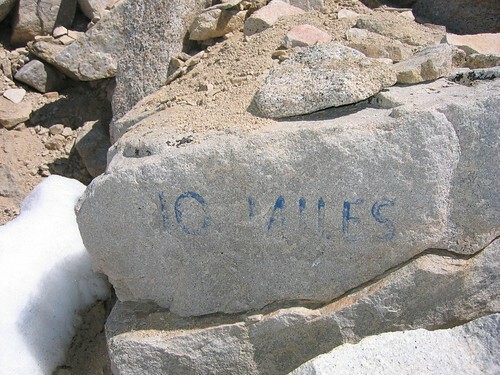 Glad to know you saw the 10 mile marker! It is pretty easy to see once you know where to look. As always, we enjoyed your trip report. We will be at the Portal July 1 & 2, and have permits to be on the mountain July 3. Jack plans to go to the top. Our daughter will be with us, so she and I will meander as far up as she wants to go. Maybe we'll get to Trail Camp. She wants to spend some time sitting by a lake and I think she will like Consultation. On the 4th, Jack and I are heading to Crabtree to do some Whitney ascents from the west side. The following week we will be back on the main trail. Hope to see you on the mountain or at the Portal. I've never relied on the markers since many were not easily seen. I don't see the harm in enhancing the markers to the original condition. This would be a good endeavor. Best to look around and over the shoulder frequently. They would be nice to have to mark one's progress in distance and time. On 13 July I found number 9. On prior trips I had searched so thoroughly on every rock in the area without success, I figured it had to be painted where people's attention was otherwise occupied. Then I noticed the slot the trail goes through just prior to the cairn for Mt. Muir. The steps you use here are tricky, and you have to pay attention to where you place your feet--not on the surrounding rocks. I thought, this is just the sort of place it might be. So I looked up and there it was, right in front of my nose. Well done, Bob Sherlock Holmes R! Somebody take a Marks-A-Lot up? If you could tell me how many steps from a switchback, or if the marker is right at a switchback, that would do. A couple of days ago, the 8 Mile Marker was 14 paces uphill from switchback #94. I guess that's 42 feet, give or take a foot or two. Close enough? By the way, the lighting was the best ever for a picture of the 97 switchbacks from Mt. Muir. I'll post it later. Bob, your link to the mileage markers no longer appears to work, which is unfortunate. I think it is an interesting resource. If there is a new link, it'd be great if you could post it. Sorry, Ken. That link was to an album on the defunct Club Photo, and showed pictures of all the markers I know about. I of course still have the pictures on my computer at home, and may get the energy someday to upload them to Flickr. No problem, Bob. Glad to hear that the documentation exists, and will not slip again to only memory. I didn't even know that these existed. I would love to see pictures if you ever get them uploaded. Bob R, thanks for the information. I will re-do my map of the 97 switchbacks and send you the file. Bob R's 14 paces places the 8-mile marker at 8.11 miles from the trailhead (due to the re-routing of the Main Trail years ago), and its elevation is about 13,225 feet above sea level. The latitude would be 33.55933 degrees north and 118.28813 degrees west (WGS84 datum). The UTM coordinates would be at Northing 3714040.2 and Easting 380429.16 for Zone 11S. Funny to read BobR's comments from '05 about the Forest Service having a "hissy fit" at the suggestion of touching up these signs. I talked to them about the same thing this past June with the same results. I find it interseting that the FS has no problem posting control type signs on the trail or at Trail Camp, I noticed new ones up all over the trail this year, but God forbid that one should even think about touching up those that already exist. I guess nothing's changes since '05! Mile-markers 7 and 8 are on the 97 switchbacks. Mile Marker-7 is above switchback #41 and Mile Marker-8 is above switchback #94. You can see a full version HERE. Thanks for taking the time to upload those for us! I was quite curious, having just been up there and not seeing any of them (but didn't know to look). Next time I'll keep a better eye out for them. The uploading time was nothing. I had to first search all of my albums--some 150 Whitney basin climbs over the last five years--looking for pictures with the right captions. 'Course, the computer helped, but then I had to handpick the best shots. thank you for taking the time to do this. i appreciate it. Thanks for posting these...nice to know where to look for them, if I think about it. I think I remember seeing one on my first trip, but not sure which. Thanks, Bob. To think that I have walked by those markers a number of times...maybe I noticed one or two of them in the past but just forgot about them. Mileage marker 1 is missing. 2 is also, but it should be in the vicinity of the picture shown, below the most northerly east chute on Thor Peak. 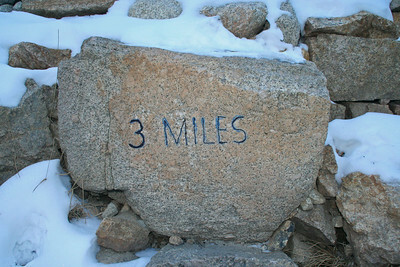 3 is near the upper end of the switchbacks above Lone Pine Lake, before getting to Bighorn Park, on the left. 4 is about 100' past the stream crossing from the outlet of Mirror Lake, high on the left. 5 is just before the first switchback at the west end of Trailside Meadow, on the right. 6 is missing. 7 is a couple of switchbacks before getting to the cables, about shoulder high on the left. 8 is at ankle level, 40' after switchback 94 (of the 97 switchbacks). 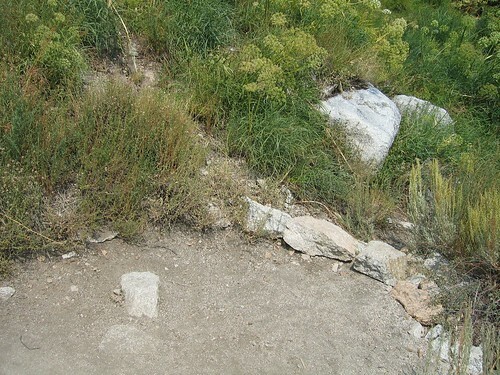 9 is where the trail goes through a narrow slot, just before the turnoff to climbing Mt. Muir. It's above eye level, on the right. 10 is situated about 1/3 mile farther along than it should be. Look on the right, about ankle level, about 100' after passing the Whitney-Keller notch.